Donald Trump and Angela Merkel are meeting this week at the White House. Like most Europeans, the German chancellor struggles to disguise her disdain for the US president’s America First nationalism. Yet in Berlin Ms Merkel’s coalition is humming its own parochial tunes. Eurozone reform? Too expensive. A bigger contribution to European security? Politically off limits. It all begins to sound like, well, Germany First. Mr Trump exults in the elevation of narrow national interests over global rules and institutions. Everything is a zero-sum game. He has disowned the Paris climate change accord and repudiated multilateral trade deals. He may soon blow up the international nuclear deal with Iran. Across the Atlantic, Germany speaks the language of a devoted multilateralist and guardian of the liberal international order. No one is keener on rules. Leaders prioritise national interests. That is what they are elected for. The gap lies between those such as Mr Trump, who think in terms of might-is-right winners and hapless losers, and those who spy a landscape of swings and roundabouts — a positive-sum game in which national and mutual interests can be aligned. Ms Merkel champions this second group. She has good reason. Germany has been the big beneficiary of European integration. Sure, it writes sizeable cheques to Brussels and underwrites financial risk in the eurozone. But look at the rewards. The common market was the route back to political respectability and economic recovery. The EU provided the framework for orderly reunification. And the euro has been the foundation for German prosperity. The economy is booming. Growth and exports are strong, unemployment at record lows, and inflation barely visible. The public coffers — federal, state and municipal — are overflowing. Here, ironically, is the problem. Mr Trump exploits the grievances of poor white America; Ms Merkel’s parochialism reflects an unwillingness to disturb Germany’s present good fortune. The outcome of September’s election was widely seen as troublesome. Ms Merkel’s Christian Democrats and its Bavarian sister party, the CSU, lost votes. So did the mainstream Social Democrats. The winners were the far-right Alternative for Germany (AfD) and the far-left Die Linke. It took months for Ms Merkel to assemble another coalition with the SPD. For all that, Germans got more or less what they wanted. The experienced and trusted Ms Merkel returned to the chancellery, but this time with constraints. The march into parliament of the AfD strengthened her party’s conservatives. They push back against any temptation to show solidarity with weaker EU partners by deepening economic integration. And the result rules out a repetition of her decision in 2015 to open the borders to refugees. Ms Merkel did the right thing, most Germans say. But she must not do it again. 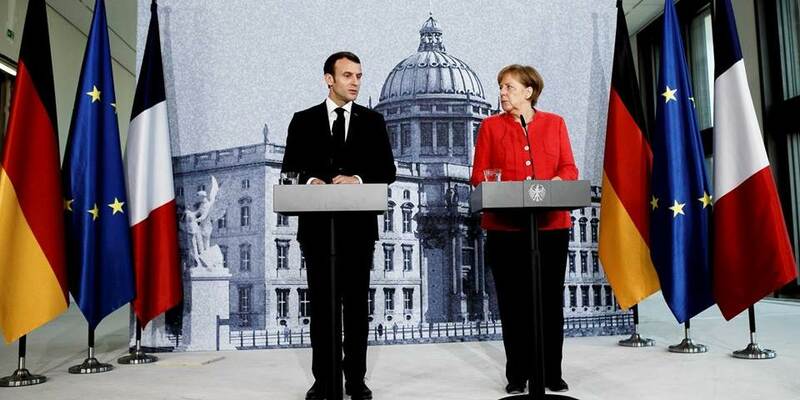 For many years Berlin complained that Ms Merkel did not have a serious partner in Paris. The old alliance — the Franco-German locomotive some called it — had broken down. President Nicolas Sarkozy was too unpredictable; his successor, François Hollande, paralysed by the office. If only Germany could share leadership, the lament went, the EU could be overhauled. Well, in Emmanuel Macron, Berlin has just the politician it asked for. In the process of smashing the old political establishment, the French president has done a rare thing. He campaigned unabashedly for domestic reform and has lived up to his manifesto. He also defied the xenophobia of the far-right National Front by writing an elegant hymn to Europe. And the Germans? They are gripped by a sudden nostalgia. Last year, I spent some time in Berlin as a visiting fellow at the Bosch Academy. Over and over again I heard policymakers warning against being misled by Mr Macron. The president was wrapping French interests in a European flag, they said — as if Berlin would never dream of such a thing. Surely, this is the essential purpose of the EU — the process of merging national and mutual interests. 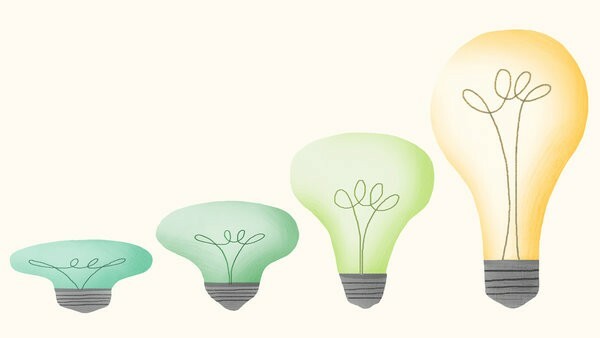 Negotiation is about finding the right point of compromise so that everyone can claim victory. But no. Mr Macron’s plans for a eurozone budget and finance minister are too ambitious in Berlin’s eyes. They would promote moral hazard among fiscally irresponsible southern Europeans. As for completing the banking union, why should German taxpayers be at risk of being asked to bail out Italian banks? And so the objections run on. So much for solidarity. Ms Merkel, one supposes, would say she is hemmed in by circumstance. True, as far as it goes. But here she is in her fourth and what must be her final term as chancellor. The economy will never be in better shape. If ever there was a moment to invest political capital — to show the leadership that takes risks — it has surely arrived. A German friend, a shrewd observer of politics, tells me that the country is doing so well that it cannot see the world through the lenses of its neighbours. A harsher judgment would stir in a fistful of sanctimony — Germany is the sole author of its good fortune, so if others have problems they must look to themselves for a remedy. Now there is a worldview that Mr Trump would applaud. Ms Merkel still has time to prove him wrong. Demand for risky loans that fund private-equity buyouts and other highly indebted companies has pushed the size of the market beyond $1 trillion for the first time. Investors should be aware that rising interest rates will make life harder for borrowers. Individual investors are pouring cash into mutual funds and exchange-traded funds that invest in leveraged loans because their income rises as interest rates go up. Bonds in contrast lose value as rates rise. Leveraged-loan funds have had nearly $5 billion of net inflows so far in 2018, according to Lipper. However, rising income for investors only works up to a point: higher rates eventually squeeze borrowers. The loan market has nearly doubled in size since mid-2012, according to S&P Global’s LCD research arm, and is expected to keep growing strongly as private-equity firms hunt for ways to invest record amounts of funds raised in the past couple of years. 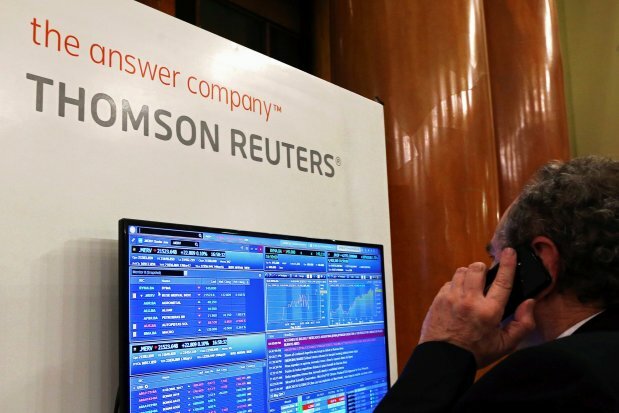 Loans due to come to market soon include a big chunk of the $13.5 billion financing Blackstone needs to back the spinoff of Thomson Reuters’ information business. The market has almost caught up with that for junk bonds, which has shrunk to $1.25 trillion from a peak of $1.4 trillion in the past couple of years. Junk-bond funds have suffered around $10 billion of net outflows in 2018, according to Lipper. 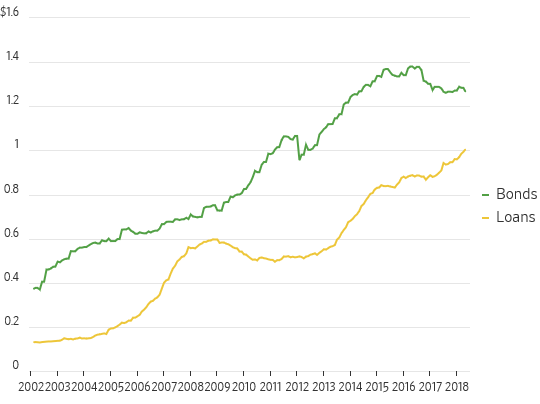 Borrowers like loans because they can be repaid or refinanced at any time and are cheaper: the yield on the S&P/LSTA U.S. loan index is 5.6% compared with 6.5% on the ICE BofAML U.S. high-yield index. At the same time, covenants on loans—which historically allowed lenders to step in if a company started to get into difficulties—have been disappearing as investors became less discerning. The upshot is risky companies have refinanced maturing bonds with loans, leading to a shrinking junk market. For investors, loans’ big attraction is protection against rising U.S. interest rates because loans pay a floating rate tied to an underlying market interest rate, known as Libor. High-yield bonds, in contrast, pay a fixed coupon, so lose value as rates rise. However, rising rates will bite eventually. Right now, companies with leveraged loans have plenty of earnings before interest, tax, depreciation and amortization relative to their interest costs. According to UBS , this interest cover is more than three times. But borrowers can only withstand three more rate rises before interest costs start to become more painful—and UBS expects six increases by 2019. The market is also riskier than it was in 2007, according to LCD. While the cost of loans is in a similar range, more than half of borrowers now are rated single-B+ or lower: In 2007, less than one-third of the market was that poorly rated. The message for investors: a lot more caution will be needed as the year goes on. FRANKFURT – When Emmanuel Macron was recently interviewed by two very aggressive journalists, the result was not exactly the “ideal speech situation” cherished by Jürgen Habermas, the towering German philosopher and great supporter of the French president. But, despite being repeatedly interrupted, Macron fared very well. Always concrete and willing, if necessary, to delve into the minutiae of an issue, Macron was clearly on top of his game. He needed no speaking notes, as he also admirably demonstrated in his speech condemning nationalism and populism at the European Parliament a few days later. His meeting with German Chancellor Angela Merkel in Berlin that same week, however, was much different in both tone and substance. Most important, it demonstrated the limits of the méthode Macron: Seemingly compelling oratory does not necessarily translate into feasible policies. Politics, at its core, reflects the interplay of interests at the national level. And that is precisely where Macron’s ideas about re-designing Europe’s institutional architecture arrive at an impasse. His proposals are too numerous and vague to judge, and they do not account for the state of debate at the national level, where skepticism is on the rise. Being positive about Europe comes at a cost. For northern Europeans, two prospects raise particular concern: risk sharing (for example, in underwriting retail bank deposits) and a eurozone budget. Of course, a fragmented banking system complicates a single monetary policy. Some academic economists, as well as the rare policymaker (such as the late Tommaso Padoa-Schioppa), called for centralized supervision of financial institutions long before the euro crisis erupted. At least in some respects, such “Europeanization” of supervision has been established, with the European Central Bank serving as the eurozone’s banking watchdog and the Single Resolution Board dealing with vulnerable banks. But guaranteeing retail deposits remains a task for the eurozone’s individual member states. Hence, the quality of those guarantees varies, with some members vulnerable to bank runs. But in northern Europeans’ (quite reasonable) view, insurance after an accident has occurred (think of non-performing loans) is a form of redistribution that shifts the burden to innocent bystanders (in this case, northern taxpayers). As German and Dutch officials, in particular, have argued, banks’ financial health must be addressed before completion of European banking union can take place. Europeanization of deposit insurance would also mean that eurozone member states would, if push came to shove, lose any authority over banking politics. A eurozone institution, democratically accountable, would have to be charged with this. But it is in regard to the proposed eurozone budget that Macron’s ideas are the least specific. And it is here where political resistance is the strongest – again, for reasons that are not difficult to understand. A common eurozone budget has been presented as both a stabilizing mechanism and an investment tool. But, under normal circumstances, national public-sector budgets already perform the stabilizing role automatically – through unemployment insurance, progressive taxation, and the like – and this is a derived role, not the primary objective. What is needed is a security valve for eurozone countries that face temporary – and particularly difficult – challenges. And an investment budget has little to do with the purpose of a stabilizing mechanism: to cushion economic shocks. So the substance of Macron’s economic-policy suggestions is, frankly, confusing. And even if Merkel were to embrace them, she would be an easy target for political attack (and not just from the opposition Alternative für Deutschland, but also from within her Christian Democratic Union and its sister party, the Christian Social Union, not to mention the Social Democrats). There is no avoiding the national political dimension in the EU, given that every leader needs to be elected, and that most want to be re-elected. Merkel’s idea of establishing a eurozone super committee that would partly substitute for the Eurogroup of eurozone finance ministers – which Dutch Prime Minister Mark Rutte already proposed, to no avail – would complicate things even further. Yes, such a committee would bring Merkel the added political benefit of constraining the influence of Social Democrat Olaf Scholz, her Vice-Chancellor and finance minister. But, in terms of substance, there was no need for her proposal. Scholz immediately endorsed the schwarze Null (balanced budget) of his predecessor, Wolfgang Schäuble. Given the German public’s deep-rooted sentiment in favor of fiscal probity, anything else would have been politically self-defeating. Indeed, with even Macron pursuing it, the schwarze Null has come back with a vengeance. But that does not make it a less flimsy economic concept, one that cannot be found in any economics textbook. This is the fundamental problem of the méthode Macron: his policy pronouncements – vague to the point of not being implementable – somehow lack the courage of his European convictions. Proposals by the French Treasury (from 2014! ), for example, presented much more detailed policy options to achieve the ends that Macron appears to seek, as did proposals developed by Italian Finance Minister Pier Carlo Padoan in 2015. Macron’s method is also marked by a strong reliance on an intergovernmental approach, which most likely reflects his understanding of French voters’ current mood. At least in this respect, the exchange between Macron and his two impertinent interlocutors last week was highly enlightening. The self-declared representatives of French society’s deep frustration did not touch on European issues at all. Macron’s commitment to disinterested dialogue, à la Habermas, is admirable. But unless and until he gets his hands as dirty with European politics as he seems willing to do for the sake of domestic French reforms, those dialogues will remain ephemeral, if not just plain hot air. Hans-Helmut Kotz, a former member of the executive board of Deutsche Bundesbank, is Program Director of the SAFE Policy Center at the Goethe University in Frankfurt and a resident fellow at the Center for European Studies at Harvard University.